apetus is the 17th of Saturn’s 33 known moons and the third largest. The astronomer Cassini first viewed Iapetus with a telescope. The satellite was observed to ‘disappear’ every 40 days, half of its 79-day orbit. Cassini noticed that the ‘winking’ moon’s entire hemisphere was vastly brighter than the other side and the moon was synchronously rotating. In our Solar System, a few rare oddities exist in a synchronic relationship. These are our Moon, Pluto and Charon and Iapetus and Saturn. 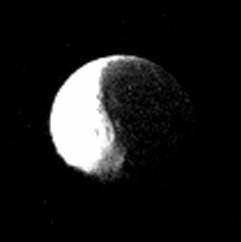 From Saturn, the observer would always see Iapetus half lit and half in darkness. We must keep in mind that a ‘synchronic’ relationship is not the norm of the universe. An artificialness is implied, possibly the work of very intelligent creatures, every time there exists an in-sync relationship between planet and its moon. ‘Gravity-Lock’ is a myth and an unnatural situation. Incredible details of this ‘exotic’ moon were revealed by the Cassini spacecraft on New Year’s Eve, 2004. The fly-by’s closest approach was within 40,000 miles. Iapetus ‘does not seem to be a perfectly round moon.’ Iapetus is visibly ‘squashed’ by at least 5%. Richard Hoagland stated that Saturn’s bizarre satellite should be round. The smaller ice worlds of Mimas, Enceladus and Dione are perfect spheres. 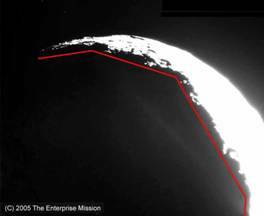 Why not Iapetus? Thank you, Richard Hoagland for these NASA (Cassini photos) and your ‘artificial moon’ theory on your web site. 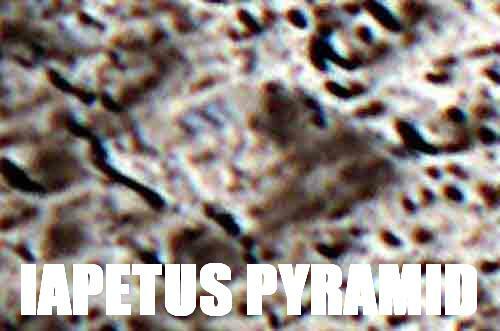 Examine the mile-high tower on Iapetus. 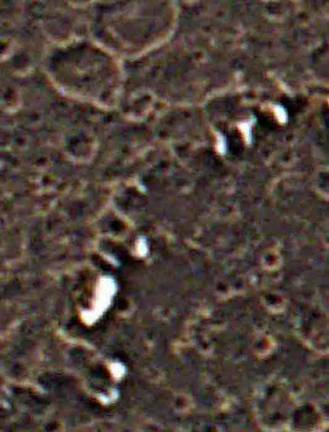 There are numerous hexagonal craters on Saturn’s moon, including one very large one as you can see in the next photos. Was Iapetus an ancient DEATHSTAR that was once operational…but, now, must orbit in silence and decay? 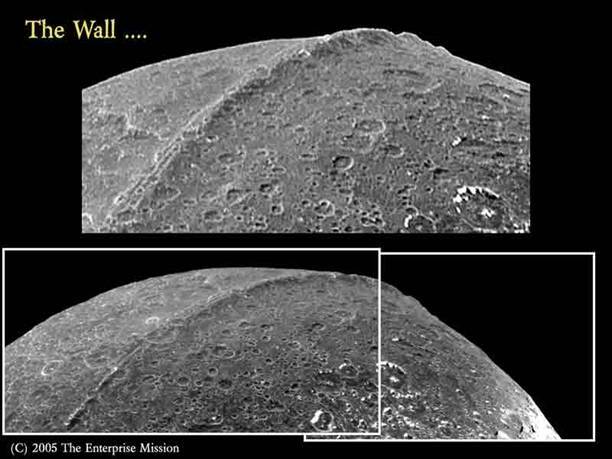 How could massive towers, walls and other titanic architecture be constructed on Saturn’s special moon? 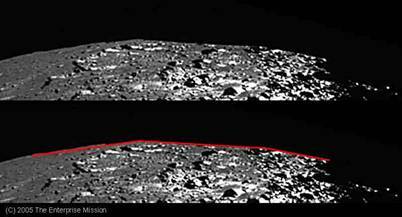 One reason is Iapetus only has 1/40 the gravity of Earth. Earth rotates once in 24 hours. Iapetus rotates once every 79 days. Gravity is not a force, but a result of rotation or relative movement. We weigh little on Earth’s Moon because of its slow rotation. On fast-spinning Jupiter, we would weigh many times our normal weight. 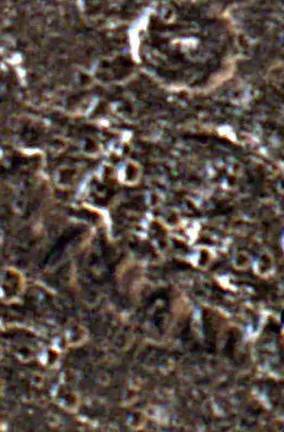 The towering structures in the following Cassini photographs are a distinct possibility on a body with very low gravity. Iapetus is abnormal for numerous reasons beside the synchronic relationship it has with the ringed planet and being two-toned. The satellite’s orbit is nearly circular, not elliptical like most orbits. Iapetus is tilted 15 degrees from the other Saturnian moons. Also, for the planet’s third largest moon, Iapetus extends very far from the planet. It can orbit more than two million miles from Saturn. 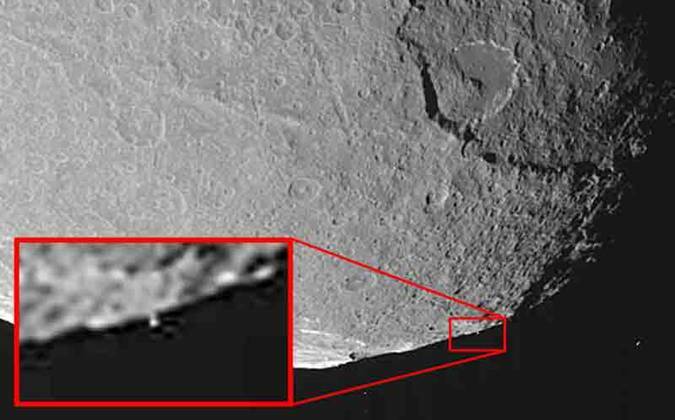 Look very closely at the following details from various sections on the surface of Iapetus. 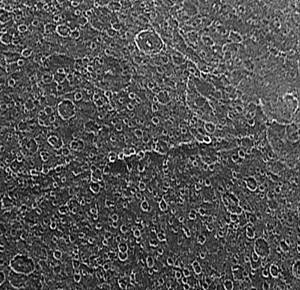 You may be observing the most fascinating ancient ruins in the Solar System! This is towering architecture that rises miles above the ground. Who built this? Micrometeorites erode ancient surfaces on planets and planetoids without an atmosphere. 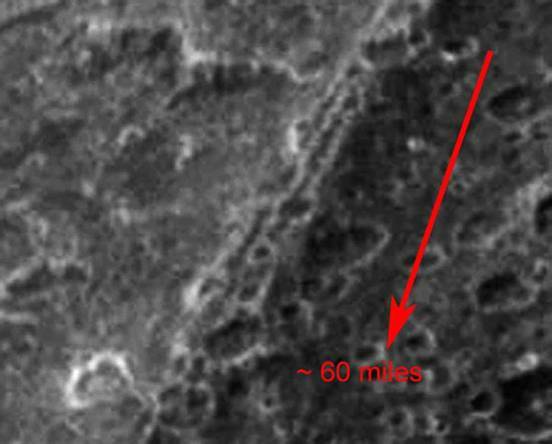 Experts believe that Iapetus has been ‘battered to hell!’ This vast, ‘mega-engineering project’ is being exposed. ‘Rebar’ patterns can be observed on a massive scale. 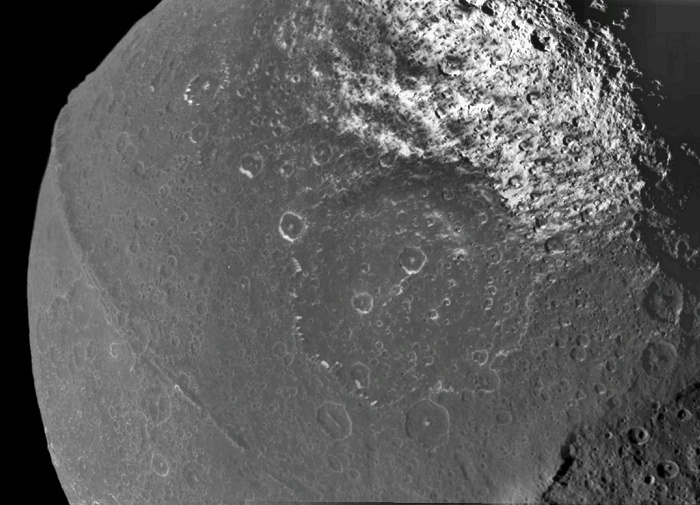 Iapetus is based on a geometric design. It is ‘the same geometry that defines a geodesic dome, a replicating tetrahedral pattern.’ LOOK AT THE ANGLED HORIZON. 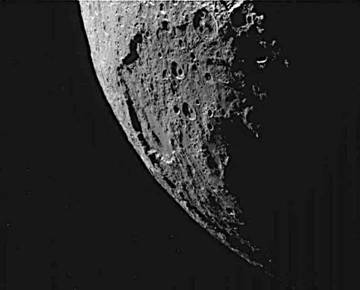 Hoagland wrote that, ‘its overall shape is not spherical like Dione or Mimas.’ Iapetus has flat, straight (horizon) planes for a hundred miles then they angle in a geodesic manner. No natural, cosmic body is supposed to have hundred-mile-long FACETS. 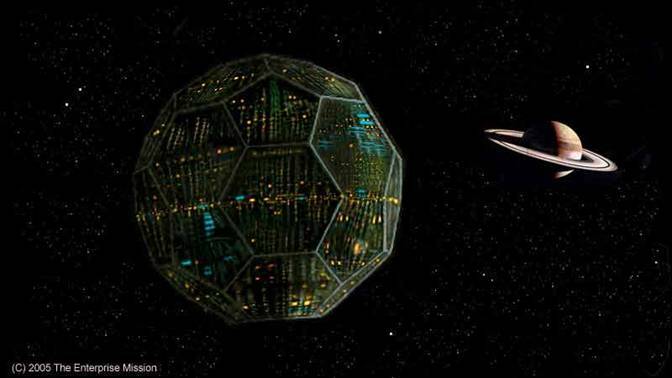 The ancient orb of Iapetus may have started with a skeletal framework that would have made Buckminster Fuller proud. Surface materials seem to have been placed over the geodesic structure in layers. We can see a 6-sided, inner grid circling the spheroid. NASA, of course, remains silent and blind to the images in their own space photography. 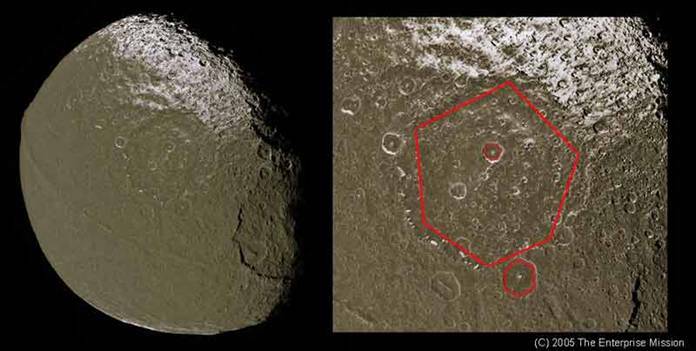 Officials see nothing strange on Iapetus; just as they do not recognize other examples of extraterrestrial ruins. 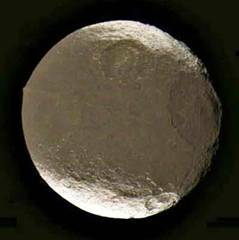 On September 10, 2007, the Cassini probe will be made to maneuver once again to incredible Iapetus. More high-resolution pictures will be taken. What will they not show us? Will they sabotage the mission? How will they attempt to change what our eyes see?